We’re all familiar with work that suffers from the three R’s -- Routine, Repetitive, and Rules-driven. Robotic Process Automation (RPA) aims to automate mundane back office work. By replacing full-time equivalent (FTE) hours with machine-based learning, departments like HR, financial services, and call centers can focus on more meaningful and strategic goals. Learn how organizations use automated machine learning with robotic process automation. RPA lays the groundwork for machine learning and more intelligent applications. If a company has an RPA solution in place, it generally means that they have an automation and data-first mentality and are probably ready for more complex machine learning models to help solve their business problems. It also means that their data is ready to be put in a format that can be used for machine learning models. Once an organization has seen the levels of productivity that machine learning can produce through RPA, many are eager to embrace more complex use cases and digital strategies. RPA is capable of gathering data needed to run predictive models in DataRobot. RPA streamlines the whole process of email classification, reading incoming email and using DataRobot AI to create a machine learning model to classify the request. From there, DataRobot predicts the appropriate channel for follow-up and RPA can forward the email to that department. With a timely follow-up from the assigned department, the workers in the department can focus on higher value work and get more time back to answer customer phone calls. This ultimately leads to a higher customer satisfaction and more timely responses. RPA uses intelligent OCR to extract application data from the paper application and make it available in digital form. It performs client outreach for missing information and then routes the completed application to DataRobot to assess the risk and provide an interest rate quote. After obtaining all the approvals, the RPA robot will then send the decision on the loan to the customer. Predicting when equipment will fail is a huge cost saver for businesses. Ensuring that a company has the right replacement part on hand and the right maintenance person to fix the problem ahead of time keeps operations running smoothly. RPA helps businesses to get ahead of the problem by gathering service logs and calling upon DataRobot to flag faulty equipment or outages. It then creates alerts for areas predicted to suffer issues and repairs equipment before an expensive outage can occur. How a customer navigates their way through a company’s phone tree can make or break their experience with a company. RPA walks through a number of steps that make the process seamless. 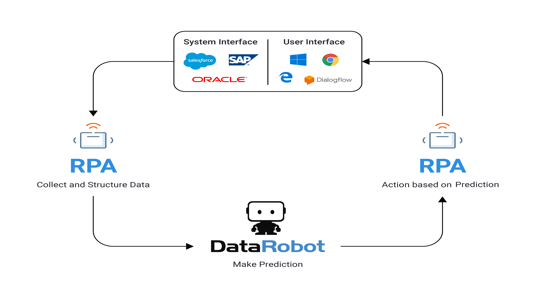 After pulling the customer profile information, RPA calls out to DataRobot, which predicts which department the customer wants to speak with, as well as the customer lifetime value and churn risk. It allows the best call center reps to deal with the highest value customers and allows customers to get routed more effectively. By looking at historical call volume, RPA combines information and calls out to DataRobot. DataRobot Time Series can forecast expected call volume and alerts managers if they are understaffed. Staffing schedules can be built on forecasted demand, resulting in reduced waiting times and lower staff costs. Machine learning models can be developed with data from several public sources. Using historical data such as Medicare, the National Provider Identifier (NPI) Database, and the CDC, datasets can be combined to derive an aggregate of drugs prescribed by county and opioid deaths. By understanding how all drugs are prescribed at a county level, agencies can identify relationships between non-opioid based drugs and their effect on the opioid death rate nationally. By looking at historical and categorical data on its employees, a company can predict future employee churn and offset it by hiring or by instituting the organizational changes necessary to fix the problem. Further analysis can also uncover future gaps in talent that will need to be addressed to ensure optimal business performance. Since it is inefficient and time-consuming to investigate every claim of medical fraud, it pays to use automated machine learning to predict fraud. Solutions can become obsolete just as quickly as they are developed, and it can be hard for the people you hire to keep up with every claim. RPA and automated machine learning can monitor the threat landscape and stay ahead of fraud in real-time. RPA + AI can transform your organization.